Chug On Into the Tampa Bay Performing Arts Center!! Good Morning Friends! Jessica here with, of course, some more things to do in Tampa Bay. So, if you are a fan of arts and culture in Tampa Bay then read on... The Tampa Bay Performing Arts Center (TBPAC) has got a great line-up of shows for the next coming weeks and I want YOU to be fully informed! So get excited because for two days only (July 25 and 26), an all new show will rock the TBPAC! 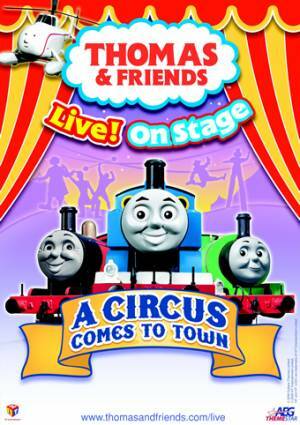 Thomas & Friends - Live On Stage in "A Circus Comes to Town" will be performed for audiences of all ages. That&apos;s right, Thomas the Tank Engine (a childhood favorite) and his friends are back for a live musical adventure. Here&apos;s more about the show: When Thomas makes a big mistake, all the engines on the Island of Sodor must work together to prepare for the exciting event under the Big Top, and, Thomas must prove he&apos;s a really useful engine once again. With thrilling adventures along the way, Percy, James, Gordon, and of course, Thomas, join with Sir Topham Hatt and the townspeople from the Island of Sodor, to welcome a colorful cast of circus performers in an engaging story that demonstrates the importance of friendship and cooperation.